If you have been to San Diego you know that Coronado Island is one of the most stunning parts of this city with its gorgeous views of the bay and the ocean on the other side. In the Ferry Landing area, there are a rows of boutiques and eateries and one of them caught my eye because of the cute clothing and accessories on display. That boutique is Miss Match which aside from having a store front, has an online presence where even if you're not in the San Diego area you can still indulge in their fashionable picks! 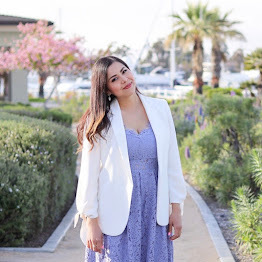 I had a chance to style a few looks with their clothes and putting together the looks came with such ease because of the casual yet classy Coronado vibe. Bonus: Miss Match is offering my readers 25% off their online orders with code chic25. About the Outfit: Miss Match "On the Fringe" Gray Sweater (here) | Miss Match Navy Blue Dress | Accessories from Miss Match Boutique. You look beautiful! Love the pictures!